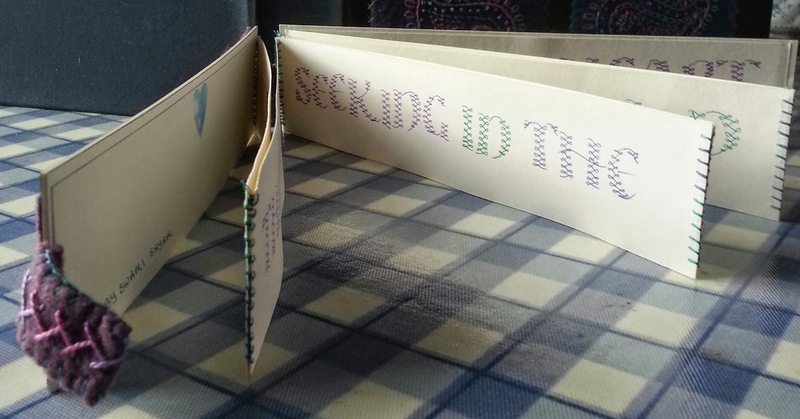 Here are some photos of a book I made on a special retreat recently. It was called a Makers retreat and we had the opportunity to have a go at calligraphy, pottery, printing, Sumi ink work and knitting. Having decided beforehand I wanted to try lettering in clay when we got there I was inspired by a book my lovely friend had made and decided to have a go at this instead. I stayed with this the whole weekend and came home with only the cover to finish off. This is the front cover, so you'll see it's a long thin book, which is quite a change for me. 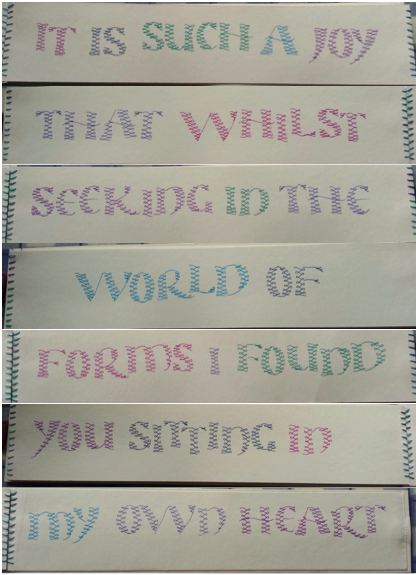 And here are the inside pages, sewn together to match the style of calligraphy. This style, which looks like an embroidery stitch, is what attracted me to the idea in the first place. And the words are just beautiful!